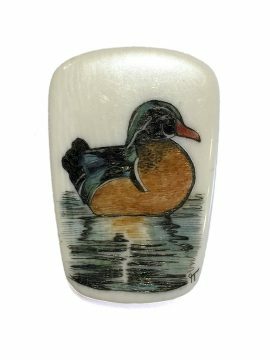 Home / Sale Items / Scrimshaw / Missed Quarry! 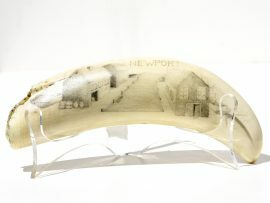 Black and white scrimshaw on whale’s tooth by Ray Peters. Classic Peters scrimshaw. Clean lines and excellent detail. This is why he has remained at the top for several decades. This is from one of our long time collectors who has decided to downsize his first rate collection. This was done by the artist between the late 1980s to the mid 1990s. He even created the handsome ebony stand. Love the detail of the crewmen in the crow’s nest as the sperm whale cow and calf remain hidden. You can even see various crewmen aboard, always working. Nice, nice work at a great price.